Viaducts could be the ideal location for wind turbines, study finds. Unlike solar energy, which can be installed on land, roofs, and many other places, wind turbine energy is far more limited, and typically requires a vast amount of land in the middle of nowhere or needs to be built offshore for it to generate the amount of power that makes installing the massive turbines worthwhile. However, a new study has found that viaducts may prove beneficial to the future of wind energy. Wind turbines could be built within the arches of viaducts. 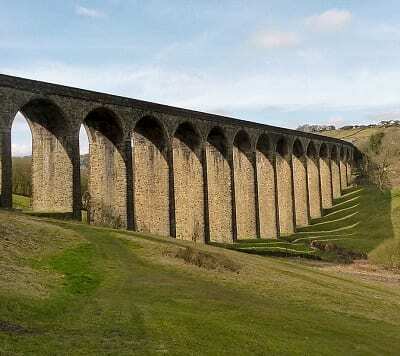 Viaducts are long bridge structures that are usually high off the ground and typically feature multiple arches. It is within theses arches that wind turbines could be constructed to produce energy. Turbines need to be high in the air in order to capture higher wind speeds. For this reason, the average turbine needs to have large blades. That said, due to their height and design, viaducts may offer a solution in areas where constructing a full-scale wind farm isn’t a feasible option. A European research team consisting of British and Spanish researchers, studied the Juncal Viaduct in Gran Canaria, and found that the wind that blows between the pillars of this infrastructure can move turbines and generate energy from wind. The researchers found that within the viaduct, wind turbine energy could power up to 500 homes. According to ScienceDaily, the study is based in models and computer simulations, and was carried out by researchers from Kingston University in London. To be able to test different kinds of configurations and evaluate the air resistance, the researchers presented the wind generators as porous discs. “As natural, the more surface is swiped by the rotor, the more power can be produced; however, it was seen that in small turbines the power rate per square meter is higher,” Oscar Soto, one of the London researchers, explained. The results of the research confirmed that wind possibilities and energy potential is specific to every viaduct. However, in the case of the Juncal Viaduct, the researchers calculated that the amount of power produced by each turbine was an estimated 0.25 megawatts (MW). Therefore, two turbines would bring the total output to 0.5 MW, which would be equal to the average energy consumption of 450-500 homes, according to Soto.